Fermion is designed to compete in this year’s game, Velocity Vortex. We have designed Fermion to be able to collect and score particles in the Centre Vortex, claim the beacons in autonomous and tele-op, and score the cap ball in end game. 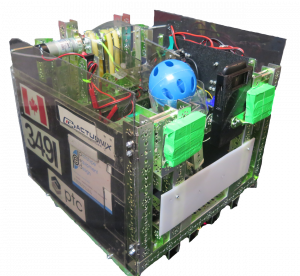 Throughout the season, Fermion has undergone many changes, including: modification for a stronger chassis, more effective collector, faster shooter, more organized electronics, and the addition of a cap-ball lifter. In autonomous, Fermion can score two balls into the centre vortex then go and press both beacons. If our partner is a shooting robot, we can also just shoot one and leave 2 balls for our partner! Fermion uses ultrasonics and encoders for navigation and OpenCV for identifying the beacon configuration. Then we use Light Sensors for identifying the white line and the Ultrasonic Sensor to tell our distance away from the wall. All of this makes for a very reliable autonomous! 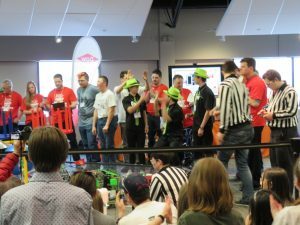 The team had a great time at the FTC Alberta Championships which were hosted at the Telus World of Science, Edmonton. Fermion performed very well, both in autonomous and tele-op! We managed to win all five of our qualification matches, so we became the first Alliance Captain. We selected Team 10015 SwatBots Red (for their amazing shooter) and Team 10544 Cyber Eagles (for their great cap ball lifter) for our alliance. It was a great alliance with all the robots working well together. During the awards ceremony, we were thrilled to be recognized as the Inspire Award winner from the Alberta Championships! 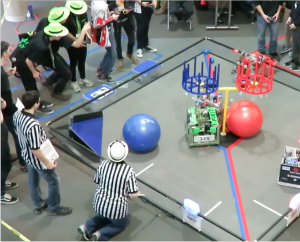 In February, we attended the first FTC competition in BC in 6 years! We had 7 rookie teams and 5 experienced teams from all over the world. Our team ranked 3rd with 8 qualifying points. We were chosen for an alliance with Auto Vortex, the team from Romania, and we became the Winning Alliance! 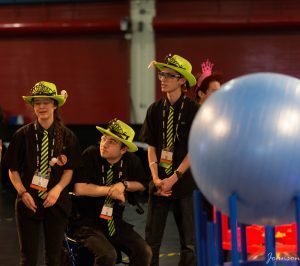 The finals matches were tough, and were very close, decided by the autonomous period and particles scored. At the end of the day, we received the Control Award! Our thanks to UVic’s Engineering and Science Lab building for agreeing to host the competition. The World Championships were amazing! The Houston venue had plenty of space which was a big improvement on last year. Fermion did a great job in the Judging Interview but the autonomous programs didn’t quite succeed as we hoped. Fermion fared well in Tele-Op and we thankfully didn’t need to use our cap ball lifter too often! And, of course… WE WON THE INSPIRE AWARD! We have a sequence of images showing our shocked reactions as it was announced. Because of this award, we’re going to the Festival of Champions in July! Big thanks to the FIRST volunteers for running an amazing competition!